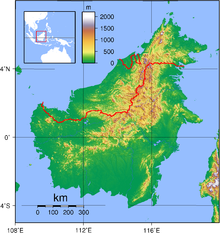 East Malaysia comprises the states of Sabah and Sarawak, and the Federal territory of Labuan. East Malaysia (Malaysia Timur), also known as Sabah, Sarawak and Labuan (Sabah, Sarawak dan Labuan) or Malaysian Borneo, is the part of Malaysia on the island of Borneo, the world's third largest island. It consists of the Malaysian states of Sabah, closer to the Philippines than the west of the country, Sarawak in the west and the Federal Territory of Labuan. Labuan is an island in its small archipelago of the same name due north of Brunei; its closest land mass is with Sabah. It lies to the east of Peninsular Malaysia (West Malaysia), the part of the country on the Malay Peninsula. The two are separated by the South China Sea. Some parts of present-day East Malaysia, especially the coastal regions, were once part of the thalassocracy of the Sultanate of Brunei. However, most parts of the interior region consisted of independent tribal societies. With regard to the administration of justice, the courts in East Malaysia are part of the federal court system in Malaysia. The Constitution of Malaysia provides that there shall be two High Courts of co-ordinate jurisdiction – The High Court in Malaya and the High Court in Sabah and Sarawak (formerly the High Court in Borneo). The current Chief Judge of Sabah and Sarawak is David Wong Dak Wah from Sabah. His office is the fourth highest in the Malaysian judicial system (behind the Chief Judge of Malaya, President of the Court of Appeal, and Chief Justice of Malaysia). In 1976, all the Sabah and Sarawak MPs supported the Malaysian parliament bill which downgraded both the states from equal partners to one of the 13 states in the federation. Sarawak, Sabah and Labuan currently holding a total of 57 out 222 seats (25.68%) in the Malaysian parliament with majority of the seats going to the ruling coalition Barisan Nasional ever since the two states hold their first state elections. However, Jeffrey Kitingan from Sabah, who is vocal of East Malaysian rights, is concerned that the number of seats from East Malaysia is under-represented in the Malaysian parliament as compared to the ideal representation of 35% stated in the Cobbold Commission report. After the conclusion of 2013 Malaysian general election, East Malaysia contributed a total of 47 parliamentary seats (35.34%) out of the 133 seats won by the Barisan Nasional coalition following the Barisan dismal performance in Peninsular Malaysia. This has resulted an increase in ministers and deputy ministers allocation for East Malaysia in the Malaysian Cabinet from 11 out of 57 portfolios in 2008 election to 20 out of 61 after the 2013 election. On the basis that East Malaysia should be treated as an equal partner as compared to the Peninsular, local lawmakers have urged the federal government since the year 2011 to appoint at least one deputy prime minister from East Malaysia to the federal cabinet. Political parties in Sarawak and Sabah evolved independently of each other. Party switching and party leadership tussles are common in both the states. The total area of East Malaysia is 198,447 km2, representing approximately 60% of the total land area of Malaysia and 26.4% of the total area of Borneo, which is 50% bigger than Peninsular Malaysia at 132,156 square kilometres (51,026 sq mi), comparable with South Dakota or Great Britain. Banggi Island in Sabah and Bruit Island in Sarawak are the two largest islands that are located entirely within Malaysia. The largest island is Borneo, which is shared with Indonesia and Brunei. The second largest island is Sebatik Island, in Sabah, which is shared with Indonesia. The major airports in East Malaysia are Kuching International Airport, Labuan Airport and Kota Kinabalu International Airport. Kota Kinabalu International Airport has also become the second largest airport in Malaysia, with an annual capacity of 12 million passengers – 9 million for Terminal 1 and 3 million for Terminal 2. There are frequent air flights by including Malaysia Airlines (MAS) and AirAsia between East Malaysia and Peninsular Malaysia. Other ports of entry to East Malaysia include Sibu Airport, Bintulu Airport, and Miri Airport in Sarawak, Sandakan Airport and Tawau Airport in Sabah. MAS also operates international flights to major cities in East Malaysia. The state of Sabah has been subjected to attacks by Moro pirates and militants since the 1960s and intensification in 1985, 2000, 2013. The Eastern Sabah Security Zone (ESSZONE) and Eastern Sabah Security Command (ESSCOM) were established on 25 March 2013 to tighten security in the region. Since 2014, a 12-hour dusk-to-dawn curfew has been imposed on six Sabah east coast districts. ^ The latter term is more commonly used in Malaysia to avoid the connotation of "East Malaysia" and "West Malaysia" (Peninsular Malaysia) being two separate countries, as in former East Germany and West Germany. ^ "Malaysia urged to scrap coal plant in eco-sensitive Borneo". AFP. 7 July 2010. Retrieved 8 July 2010. ^ "Location". Malaysia Travel.org.uk. Archived from the original on 23 September 2010. Retrieved 7 July 2010. ^ "Malay Peninsula". HarperCollins Publishers. Retrieved 7 July 2010. ^ Push for Sabah, S'wak's independence: Next stop UN Archived 7 September 2012 at Archive.today. Malaysia-today.net (2010-04-02). Retrieved on 2013-07-29. ^ "'Know Federal System' advice". Daily Express. 21 May 2010. Archived from the original on 21 June 2011. Retrieved 9 July 2010. ^ Chia, Jonathan (19 October 2016). "All round aye from Sabah, Sarawak". The Borneo Post. Archived from the original on 19 October 2016. Retrieved 20 October 2016. ^ Rintod, Luke (8 March 2012). "'Sabah, Sarawak's 'right' to have more parliament seats'". Free Malaysia Today. Archived from the original on 14 July 2014. Retrieved 16 June 2014. ^ "20 ministers, deputy ministers from East Malaysia". Sin Chew Daily. 16 May 2013. Archived from the original on 14 July 2014. Retrieved 16 June 2014. ^ "The new cabinet, by party and in numbers". Malaysiakini. 15 May 2013. Archived from the original on 14 July 2014. Retrieved 16 June 2014. ^ Chieh, Yow Hong (27 October 2011). "East Malaysian DPM gratuitous, says Dr M". The Malaysian Insider. Archived from the original on 14 July 2014. Retrieved 16 June 2014. ^ "Appoint DPMs from East M'sia, Putrajaya urged". Malaysiakini. 15 June 2014. Archived from the original on 16 June 2014. Retrieved 16 June 2014. ^ "Motorcycle tour description and itinerary for the Borneo-East Malaysia motorcycle tour". Asian Bike Tour. Archived from the original on 2 April 2010. Retrieved 20 July 2010. ^ "Dive The Kakaban Island". De 'Gigant Tours. Archived from the original on 15 May 2011. Retrieved 20 July 2010. ^ "Sebatik Island off Sabah, Malaysia 1965". The Band of Her Majesty's Royal Marines. Archived from the original on 17 July 2011. Retrieved 20 July 2010. ^ "Gunung Mulu National Park". UNESCO.org. Archived from the original on 16 October 2015. Retrieved 20 July 2010. ^ "Kinabalu Park". UNESCO.org. Archived from the original on 14 June 2010. Retrieved 20 July 2010. ^ Noreen (10 January 2010). "Diving at Sipadan Island, Borneo – An Untouched Piece of Art". Aquaviews: Online Scuba Magazine. Retrieved 20 July 2010. ^ "Chart 3: Population distribution by state, Malaysia, 2010" (PDF). Population Distribution and Basic Demographic Characteristics 2010 (in Malay and English). Department of Statistics, Malaysia. p. 2 (p. 13 in PDF). Archived from the original (PDF) on 30 August 2011. Retrieved 13 December 2012. ^ "SPECIAL REPORT: Sabah's Project M (subscription required)". Malaysiakini. 27 June 2006. Archived from the original on 18 July 2014. Retrieved 23 June 2014. ^ "RCI report on Sabah's illegal immigrants handed to PM, Agong". The Malay Mail. 19 May 2014. Archived from the original on 26 August 2014. Retrieved 23 June 2014. ^ Chi, Melissa (3 December 2014). "'Corrupt officials' blamed for Sabah problems, but RCI says hands tied". The Malay Mail. Archived from the original on 25 December 2014. Retrieved 10 December 2014. ^ Then, Stephen (13 September 2013). "Repair Pan Borneo Highway now, says Bintulu MP following latest fatal accident". The Star (Malaysia). Archived from the original on 6 February 2016. Retrieved 23 June 2014. ^ "Pan Borneo Highway project will be carried out in stages, says minister". The Star (Malaysia). 14 November 2013. Archived from the original on 4 September 2015. Retrieved 23 June 2014. ^ a b "Getting To Borneo By Air, By Car, By Train". Asia Web Direct. Archived from the original on 12 June 2011. Retrieved 15 July 2010. ^ Chan, Julia (5 November 2014). "Sabah curfew renewed for the seventh time". The Malay Mail. Archived from the original on 22 December 2014. Retrieved 6 November 2014.